There is in fact nothing like being woke up at 6 in the morning to a crash so big it shakes your entire apartment. It would seem between our move, the unnatural heat, and probably the pure amount of books I own, my book case is no more. This was in fact the bigger of my two book cases in my bedroom. Luckily none of the books were harmed and neither was my cactus Jekyll. So now all of my books are back to being stacked against the walls of my room. 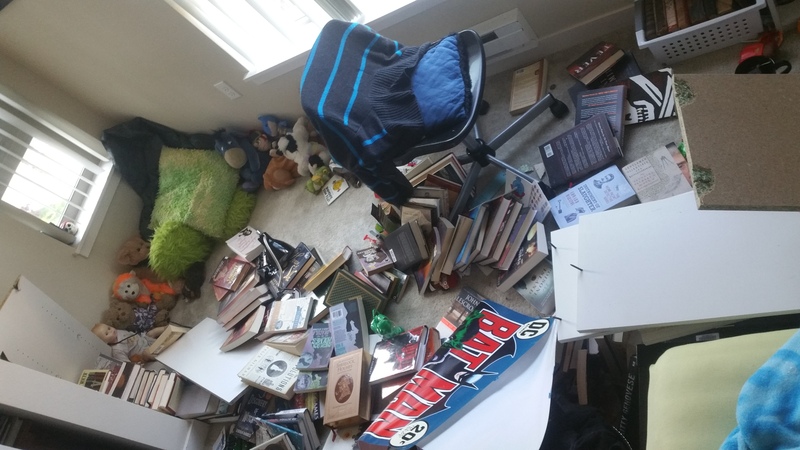 I thought about buying a new book case, but about a day after this happened I was told that my Great Grandmother's writing desk was in the process of being shipped to me. So, on the upside I now have a place for the desk,but I now have to wait for it to arrive in order to see what kind of space I'll have left in my room. Until then the books will just have to amuse my cat, who enjoys knocking the piles of over like a child with building blocks. This is probably why the instructions tell you to screw this type of case into the wall, as well. Or, I just need to buy a more hearty book case.